Montessori with your 18 month old can be such a rewarding time. Your child’s independence is growing every day and I’m sure you have noticed he or she is able to do much more for themselves then only a few short months ago. In order to facilitate there need for independence the best thing you can do is to be prepared. Be ready to give them a new challenge, create a prepared environment without distractions, and know what’s coming next so you are always able to help guide them through their journey. 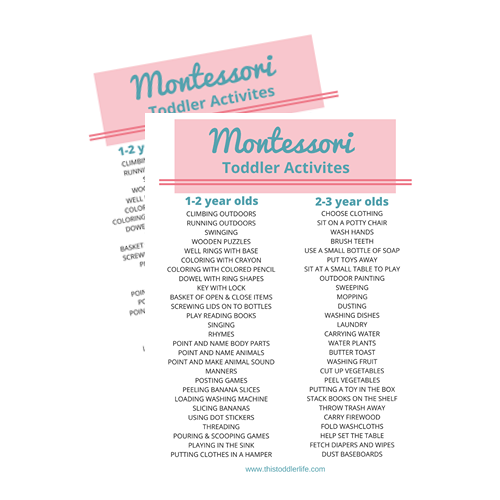 It may be a good idea to go back to the previous Montessori by age articles listed below to see what activities or materials you didn’t get a chance to use yet. Also, if something seems too difficult for your child going back to look at easier activities. This will be a big help with any frustrations they may be expressing. Click here to check out Montessori for 15-18 months. 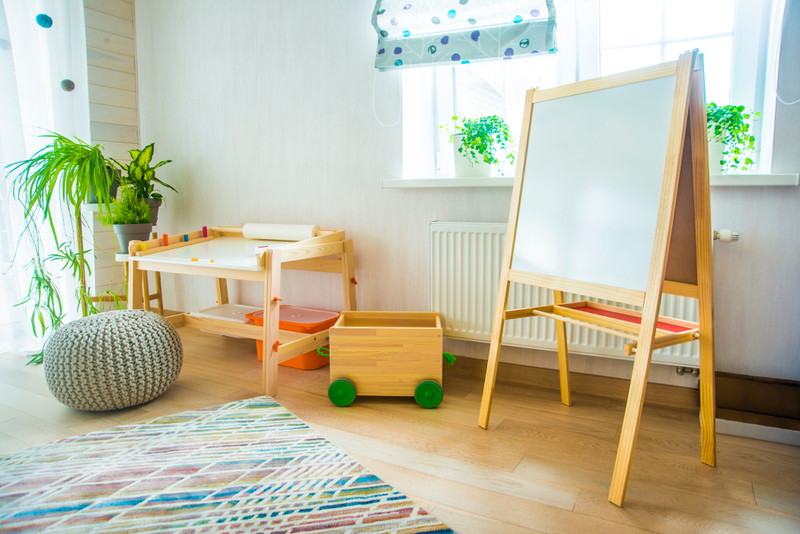 Preparing your environment is something that constantly needs to be evaluated as your child grows through different developmental stages. This will help support your child’s independence and through his/her sensitive periods which we will talk about below. and the Area for Physical Care. The area for sleep should have very few distractions (no toys). If you haven’t switched your child to a floor bed yet, it’s not too late. The low bed offers your child a better perception of their environment and allows them to move forward in their path towards independence. Other items for your child’s area for sleep include a wooden stool for dressing and a child-sized wardrobe for easy access. The area for feeding will mostly be in your dining area or kitchen. You can aid your child with items such as a learning tower and child-sized dinnerware. Allowing your child to help and set up as many practical life activities in this area will be very beneficial to your toddler. Lastly, the area for physical care will help your toddler gain independence. Setting up a self-care station in the bathroom is the perfect way to support your child in this area. Storing your child’s materials on an eye-level shelf in your main living space is best. Anywhere between 6-12 toys or materials is a good number to have out at one time. Also, keep in mind that rotating the materials every few weeks is highly suggested. Around 6-8 books can be set out as well. You can use a forward facing bookshelf or basket to store them. As long as your child can see the front of the book when making a selection rather than the spine of the book. Using an educational program such as Monti Kids will be of great help. This program is designed to take the guesswork out of finding Montessori materials suitable for your toddler. Learn more about Monti Kids and how they can help you find age-appropriate Montessori materials. Just click here and use the promo code TODDLER30 to get $30 off your first order. As a quick reminder, try not to correct the child when they are concentrating. It is suggested to wait until they are finished and then model the correct way to use the material for them continuing to present and model the activity to them each time until they correctly use the item. Toddlers often repeat the same activity over and over again. This may seem funny to us as parents but it is your child’s way of understanding how the material works. Allow your child to repeat the activity as long as he or she sees fit. Most likely they will continue to do so for a few days and then fill complete one day and not be interested in the material again. Throwing and getting frustrated is a toddler’s way of communicating that a task is too difficult or too easy. If your child continues to get upset with an activity it is best to take it out of rotation and bring it back out at a later date. Start to introduce practical life activities to your child by first observing your child’s interests. Present the activity to your child remembering to practice beforehand. Starting with one activity and building more and more. Practical life can be done in the kitchen, bathroom, outside, and just about anywhere in the home! The child’s absorbent mind (age 0 – 6 years) is driven by what Maria Montessori identified as sensitive periods in development. Follow your child’s lead for his/her cues of sensitive periods beginning. Try not to underestimate your child’s ability or work. If he/she is doing certain work over and over, they are probably in their sensitive period for that work/task. Ready to take the next step into Montessori living? Join us in The Montessori Learning Center to learn everything you need to know about Montessori with your 18 month old to 21 month old! Click the image below to learn more. What questions do you have about Montessori with your 18 month old – 21 month old? Pop them in the comments below so I can help you get started with your Montessori journey! Disclaimer: This isn’t the end all be all for Montessori with your 18 month old – 21 month old. Montessori is largely based on following your child’s lead, knowing that every child is unique, there can not be one set standard for every child. Use this information as it suits your child. It’s why I can’t get her to beat an egg -she wants to eat it and that’s risky where I come from . Where is that table in the picture from where they can color on etc? This is so helpful. Our youngest son has Down syndrome and has just turned four. I didn’t look into Montessori for our other children, but I feel it is right for him. Many of the things in this post are relevant to him and so helpful for me. We homeschool our kids so our home is always busy and sometimes loud and chaotic but I am working towards a simple, uncluttered, easy access environment for Michael’s toys and resources, using your recommendations.